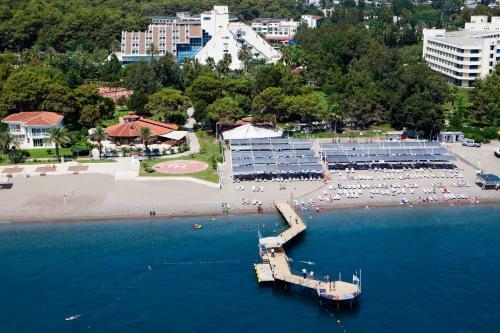 Located at the seafront of Kemer, Queen's Park Goynuk Hotel has a 50-metre-long private beach with free sun loungers and parasols. There are 2 outdoor pools, a children’s pool, a heated indoor pool, an aquapark and 2 tennis courts on site. Modernly furnished, the rooms of Queen's Park Goynuk Hotel include a flat-screen TV, air conditioning, minibar and a balcony. The private bathrooms come with a bath tub or a shower. The main restaurant offers meals in open buffet style. There are 2 à la carte restaurants and 4 bars on site. Kemer town centre is 7 km from the hotel. Antalya Airport is 92 km away.